CHARLESTON, S.C.'When the Space and Naval Warfare Systems Command gets an Internet Protocol Version 6 intranet up and running this year, it will have very little company. The SPAWAR Systems Center in Charleston is the first'and so far the only'military organization to be allocated any IPv6 addresses, said Michael P. Brig, the command's Next Generation Internet program manager. Other Defense Department entities are studying the impact of IPv6 on their systems, but so far none is ready to use the new successor to IPv4. SPAWAR's Michael P. Brig says the Navy will have an IPv6 intranet online in nine months. The Defense Information Systems Agency is in charge of doling out IP addresses, both Version 4 and Version 6. But as yet DISA has no IPv6 address blocks. 'No one right now is demanding that service,' said Maj. Randall W. Bland of DISA's Network Protocol Services division. Native IPv6 network service, however, will be available on the Navy-Marine Corps Intranet through WorldCom Inc., which will provide parts of the NMCI backbone on its very-high-performance Backbone Network Service Plus (vBNS+) network. WorldCom has been allocated IPv6 address space but has not received any NMCI requests, said Charles M. Lee, executive manager of WorldCom Government Markets. Leading hardware and software vendors and network providers have either released or announced plans for products that support IPv6. Although conference participants agreed that Version 6 is inevitable, it is not yet ready for production deployment, Lee said. The Internet Engineering Task Force began working on the new version in 1993, and the core specifications now are IETF draft standards, said Steve Deering, a fellow at Cisco Systems Inc. of San Jose, Calif. Draft status does not mean IPv6 is unstable, Deering said. IETF rarely grants full standard status until a draft standard has been widely implemented for several years. The boom in wireless computing is forcing IPv6 into prominence because of the proliferation of networked cell phones and personal digital assistants and other portable devices. 'If the commercial world moves to IPv6, I don't see any way we are not going to have to move,' Brig said. Although some existing networks can grow through addresses already allocated to them, new applications and organizations have a tough time getting any addresses at all. The 128-bit address space of IPv6 will make an exponential jump in the number of unique addresses. Europe and Asia are far ahead of the United States in deploying the new protocol. 'Europe and Asia are going wireless, and they can't do it with IPv4,' said James Bound, a Compaq Computer Corp. engineer who co-chairs the IPv6 Forum's technical directorate. The American Registry for Internet Numbers allocates IPv6 address blocks in North and South America and sub-Saharan Africa. ARIN has allocated 10 sub-top-level address blocks in what it calls the bootstrap phase of operations. Registries for Europe and Asia have allocated 41 address blocks. ARIN requires address recipients to deploy a production network within 12 months of getting the addresses. SPAWAR received its address block about three months ago, so it has about nine months to get its network up, Brig said. That network, called Commander in Chief for the 21st Century, or CINC21, will use the Defense Information Systems Network's Leading Edge Services network as its backbone. Hardware is being tested.
' 1971: The Defense Advanced Research Projects Agency's Arpanet begins to use the Network Control Protocol.
' 1973: Work starts on the Internet Protocol to replace NCP.
' 1978: The Defense Department adopts IPv4 as the standard for end-to-end packet switching.
' 1983: Transition to IPv4 is completed.
' 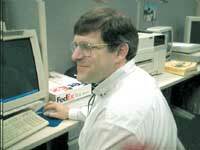 1990: Internet control moves from DOD to the Commerce Department, and Arpanet is decommissioned.
' 1992: Commercial traffic begins on the Internet.
' 1993: As traffic growth makes IPv4 weaknesses apparent, the Internet Engineering Task Force issues a request for comments for a new IP version.
' 1995: IPv6 prototypes appear.
' 1998: The government privatizes Internet control through the Internet Corp. for Assigned Names and Numbers.
' Today: More than 95 million IPv4 addresses have been assigned, and exponential Internet growth continues from new devices. Brig described how SPAWAR plans to use the 13-bit backbone address space available for each packet. The first two bits define the security level, the next three define one of eight geographical target areas, seven bits identify up to 128 theater sites, and one bit is reserved for expanding the other identifiers. As the network moves out of the bootstrap phase, more address space will become available. In a 25-bit backbone address, SPAWAR probably will use three bits for the security level. The number of possible theater sites could expand to 8,192, and four additional bits would be reserved for expansion or reorganization. CINC21, like the commercial vBNS+, will run both versions of the Internet Protocol. Vendors of products with IP stacks are building hybrid stacks that support both versions, and the dual system is expected to endure for a long time. Like mainframes and Cobol, IPv4 will not die. Rewriting all existing programs to accommodate 128-bit address space would be a bigger job than fixing the year 2000 date problem. If the switch seems daunting now, it will probably have to happen again'eventually. But 'I don't think there is any natural boundary for these things,' said Robert Kahn, president of the Corporation for National Research Incentives and systems designer for the Arpanet, the Defense Advanced Research Projects Agency's original packet-switching WAN.